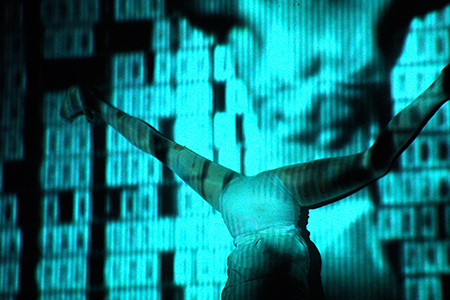 In the live work Beautiful Radiating Energy (2004), K8 Hardy performs and shouts, her exercising body cross-cutting a video collage. In New Cuts, this performance is experienced in video and in other creatively-inflected documents and paired with New Report: Morning Edition (2005). New Report: Morning Edition is a real report on objectification by the camera and language of Hardy's with a collaborator, Wynne Greenwood. New Cuts is an exhibition of performative activity by Hardy and an exhibition about the viewer's viewing. For Hardy, a videomaker and zine producer, this period in New York from 2002 forward was marked by intensity: Hardy both developed her embodied work in live performance and experimented with the nonsovereign space of coproducing with others. Those others included artist Klara Lidén, with whom Hardy staged Beautiful Radiating Energy; the musician and videomaker Greenwood, herself touring Tracy + the Plastics at the time; the queer and feminist journal and events program LTTR (with Ginger Brooks Takahashi, Ulrike Müller, Emily Roysdon); and Reena Spaulings, the project of artists who mutate and hybridize the gallery form. Rhea Anastas and Litia Perta consider performative activity on view in New Cuts by K8 Hardy (b. 1977 Fort Worth), a videomaker and zine producer, as well as work by others. During an intense period of cultural activity in New York from 2002 until 2006, Hardy developed queered live performances, including Hardy’s first work for an art venue, Beautiful Radiating Energy (2004), and pursued creating from the nonsovereign space of coproducing with others. Rhea Anastas is a scholar of contemporary art and critical and cultural theory and is Associate Professor in the Department of Art, University of California, Irvine. Anastas co-founded Orchard, the experimental New York gallery that operated on the Lower East Side from 2005-2008 (with Andrea Fraser, Nicolás Guagnini, R. H. Quaytman, Jason Simon, Jeff Preiss and six other artists). Anastas' current book project is a collection of writings related to the collaborative space, edited with Guagnini. Litia Perta is a writer and Assistant Professor in the Department of Art, University of California Irvine. Through lyrical non-fiction, critical theory and performance, her research mobilizes an interdisciplinary examination of the ways in which non-normative subjectivities come to personhood through art. Perta's most recent work, "Your Heart is a Strong Muscle, It Squeezes Very Good" rethinks the possibilities of performance and its relationship to being in the works of Wu Tsang, Jérôme Bel and Haegue Yang (forthcoming, Contemporary Art Museum Houston).